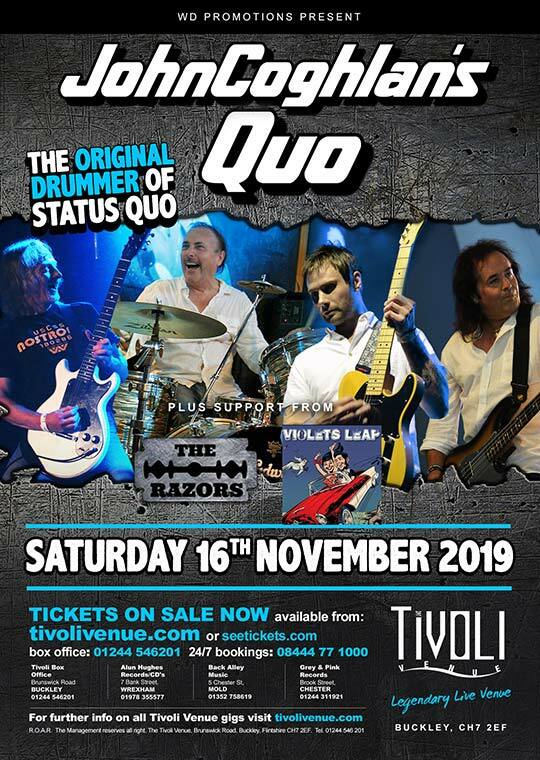 After a roof-raising night back in November 2017 and again in December 2018, we welcome back Quo legend John Coghlan back for a third consecutive year! John Coghlan joined Francis Rossi and Alan Lancaster in their newly-formed band ‘The Spectres’ in 1962. The group went through a series of name changes, including Traffic Jam, before becoming Status Quo in the late 60s when Rick Parfitt also joined the line-up. In the years that followed, a string of chart-topping albums and an almost endless stream of hits included Pictures of Matchstick Men; In My Chair; Paper Plane; Caroline; Down Down; Rain; Wild Side Of Life; Rockin’ All over the World, and many more. For Quo fans and critics alike, this time is often regarded as Quo’s “Classic” period. During the late nineties John Coghlan’s Quo was formed and through various line-ups has enjoyed regular gigs all over the UK and Europe. The current band (previously performing as The John Coghlan Band) consists of John on Drums with Baz Barry and Mick Hughes from NWOBHM Boogie Band ‘Predatür’, and Rick Chase on bass and vocals completing the line-up. Whilst Baz is currently having medical treatment, Rick Abbs is a fantastic replacement. John Coghlan’s Quo – The prime aim is to recreate an authentic “70’s Quo Sound” in keeping with John’s time with Quo. For Quo fans and critics alike, this time is often regarded as Quo’s “Classic” period. Support comes in the form of The Razors and Violets Leap.